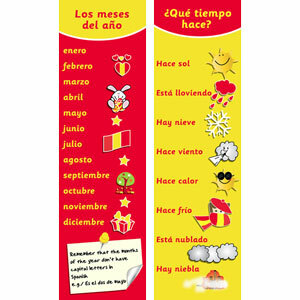 Your pupils will never lose their place again with a super Spanish bookmark! Double-sided and printed onto strong card, each bookmark will help pupils to learn useful Spanish vocabulary relating to the topics of months and weather. Supplied as a pack of 20. The Year 3 children loved this bookmark, which we presented to them as little Christmas presents, following a term learning about the weather.